Most know Dropbox as the freemium cloud-based storage service for saving and sharing documents, photos, and videos. The free version, Dropbox Basic, gives you only 2GB of storage to play with, leaving little wiggle room if you want to fully benefit from cloud-based storage. The upsell opportunity is to migrate to Dropbox Business where, for a small fee per month, you can boost your storage space to a whopping 2,000GB (2TB) and benefit from a variety of cool features, like 120-day file recovery, Smart Sync for desktop access and flexible user, and document management. The problem is, not every user is in need of or suitable for Dropbox Business, which means a blanket approach to an upsell prompt will be annoying, and detrimental to the user experience of many. To solve the problem, Dropbox gets personal and punctual with their upsell tooltips to approach the right users at the right time. The line between a tooltip or modal done right and done wrong is extremely fine. When a tooltip or modal is too disruptive, the user will enter a rage of clicking it away. When too subtle, your message simply won't be registered. Here, Dropbox gets it just right. All the upsell activity is situated outside the user's line of work to avoid causing any frustration. This way, the messages are likely to have much more screen time, increasing the chances of getting the message across. The upsell prompts are contextual. The user still has some storage space, but it is running low. With resources scarce, the user is likely to want it more. And because people have an intense dislike of loss, they're more likely to act so they can continue using Dropbox freely. This prompt is not all about upselling: It also acts as a warning of an upcoming issue. Without it, users would unknowingly consume all of their storage limits and find themselves in an inconvenient situation when it is maxed out. The best way to deal with errors like this is to stop them from happening in the first place, which is what these prompts do. To convert users into customers TY Music has to demonstrate the premium benefits in a candid way. 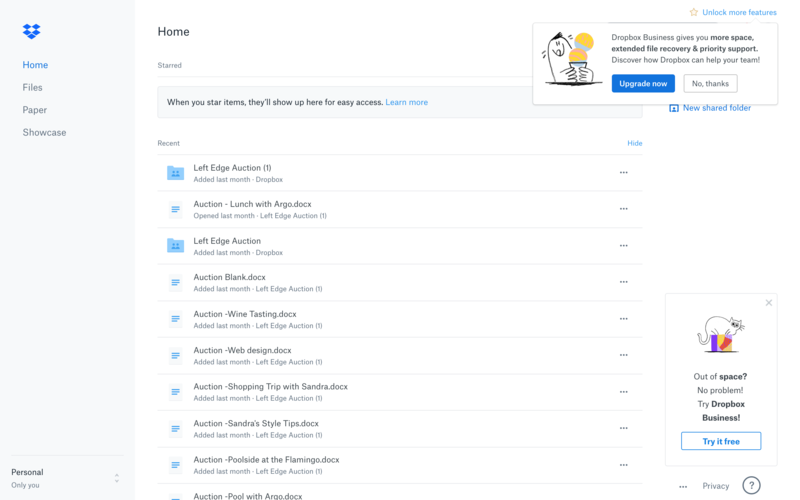 Dropbox gets personal and punctual with their upsell tooltips to approach the right users at the right time. In this example, The New Yorker uses a carefully designed modal to convert readers into customers.